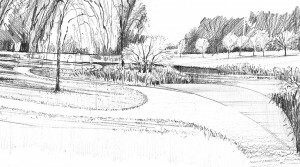 With a delightful brief to design an ambitious private arboretum, we created an enticing layout with walks that draw people toward a pavilion. 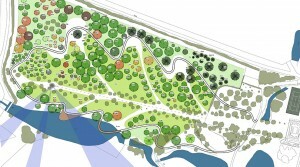 Over 200 tree varieties have been chosen to grow in the heavy ground in collaboration with Barcham Trees and the arboretum has been designed with a generous spacing so that the eventual tree canopy will form enclosure but with greater space provided for particular trees to become magnificent stand-alone specimens. 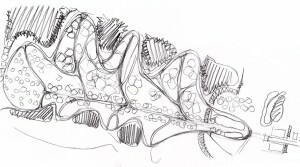 An oak leaf has provided the idea for the underlying framework. Whilst this would not be discernible on the ground, it would provide a nice talking point and also gives a structural form that makes sense in terms of layout, organization and circulation. 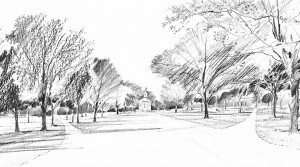 The central vein of the leaf would come from the cherry tree avenue, providing a direct route to the pavilion and a linear spine to the arboretum. 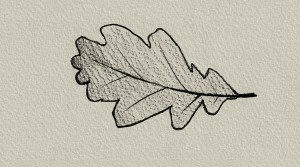 The outline of the oak leaf provides an outer circuit to the arboretum, surfaced to make it all weather and a route for maintenance vehicles. 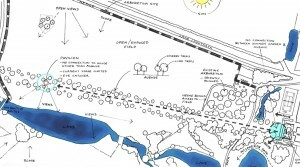 This meandering route would create a different experience to the spine avenue, with constantly changing views, aspect and interaction with the tree collection. Where the leaf outline kisses the lake edge, we have suggested the path curves out over the water in the form of boardwalks or jetties. 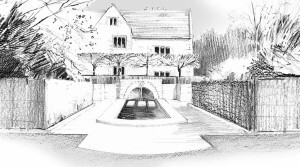 Connecting the spine to the outline, intermediate ‘veins’ splay outwards from the cherry avenue to the leaf outline thus connecting all parts of the arboretum. These would be grass paths of gentle curves and less meandering than the outline. 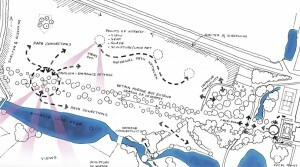 Where these intersect the outer path, ‘nodes’ are formed which can be openings or glades within the tree canopy; special places for attractive benches, specimen trees, patches of bulbs, or for works of art or pieces of interest such as sculpture or land art.